A man has been jailed for life for the murder of a policewoman who was shot dead during a bungled robbery. 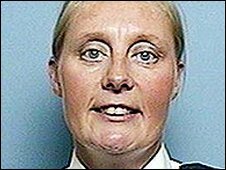 Pc Sharon Beshenivsky, 38, was killed outside a travel agency in Morley Street, Bradford, in November 2005. Mustaf Jama, 29, who denied murder, was convicted after a retrial at Newcastle Crown Court. A judge told him he would spend at least 35 years in prison. Jama did not fire the fatal shot, but the prosecution said he was "as much guilty of murder" as the gunman. He was part of a gang that shot the popular officer and wounded her colleague, Pc Teresa Milburn, as they responded to an alarm call at the premises. The gang believed that up to £100,000 could be inside, but they escaped with little more than £5,000. Sentencing Jama, judge Mr Justice Openshaw said he was one of a "team of ruthless and dangerous men". He said although there were flaws, the robbery was well planned "and executed with ruthlessness". The judge said: "The impact that the murder of Sharon Beshenivsky has had upon [her widower Paul] and their five children will no doubt continue to be felt for the rest of their lives." Paying tribute to Pc Beshenivsky and Pc Milburn, he said: "They only did their duty and paid a terrible price." 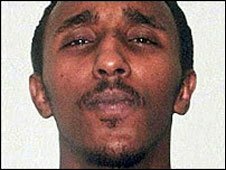 Using a friend's passport, Jama fled to his native Somalia following the murder but was brought back to the UK in 2007 after being smuggled out of Africa in an undercover operation. Pc Beshenivsky, who had three children and two stepchildren, had been a serving constable for nine months when she died. Five other men have already been convicted in connection with her death. 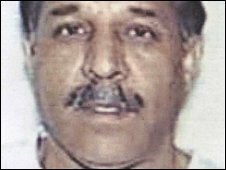 They include Jama's younger brother Yusuf and gang boss Muzzaker Shah, who is thought to have fired the shot which killed Pc Beshenivsky. The judge criticised Mustaf Jama for putting Pc Beshenivsky's family through another trial, following that of his brother and Shah, because he fled to Somalia. He said: "His flight has made it necessary for the victims, including of course the family of Sharon Behsenivsky and Pc Milburn and, indeed the victims of the robbery, to go through the distressing ordeal of a second trial." Det Supt Andy Brennan said the investigation into Pc Beshenivsky's death would continue until the last remaining suspect, Piran Ditta Khan, was found and placed before the courts. Mr Khan has been on the run since the killing. Mr Brennan appealed for anyone with information about his whereabouts to contact police. Outside court, Mr Beshenivsky said: "It has not brought closure but it has made me happier to know he has gone down with the rest of them." In a statement, Pc Milburn said she was "relieved" that Jama would spend the next 35 years in jail. Has policing got more dangerous?